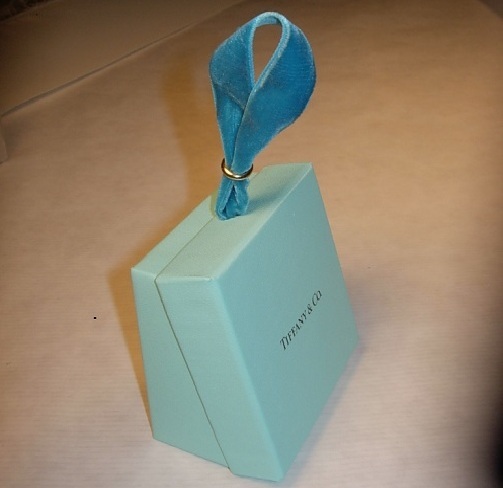 My sister received a gift from Tiffany’s and asked me if I would like the box to repurpose it. I happily took it knowing the teal color would work well in my decor. After some thought I came up with the idea to make a Christmas tree ornament. 1. Open box and mark center on the top part of the lid and box with a pencil. Using a hole punch, punch a hole in each, making sure they line up when closed. 2. 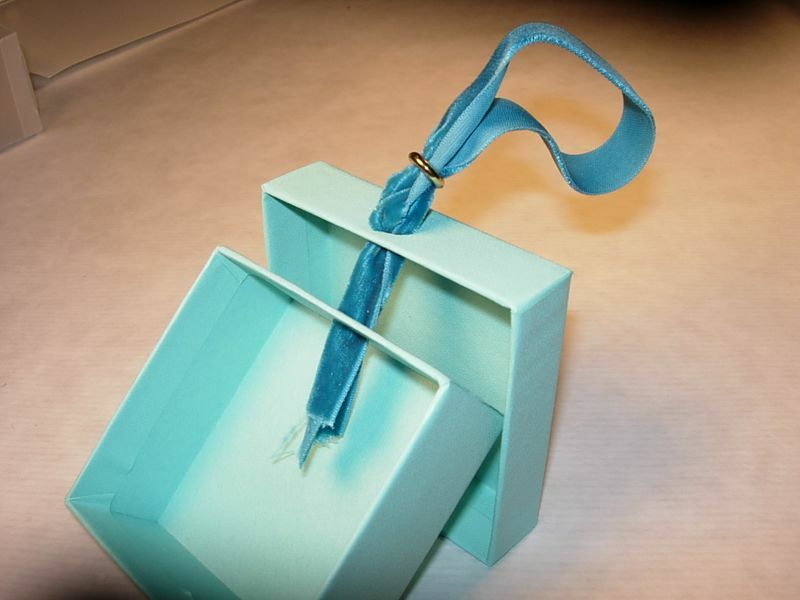 Fold ribbon in half and thread a large-hole bead, decorative ring, or button onto the ribbon. 3. 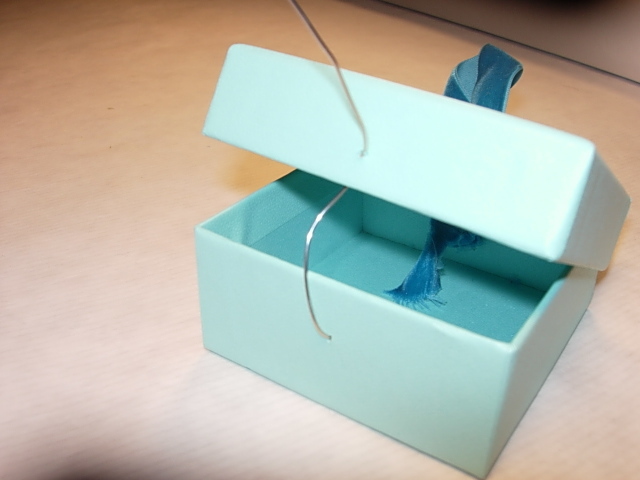 Thread ribbon through the lid hole first, then the box. 4. Tie ends into knot. 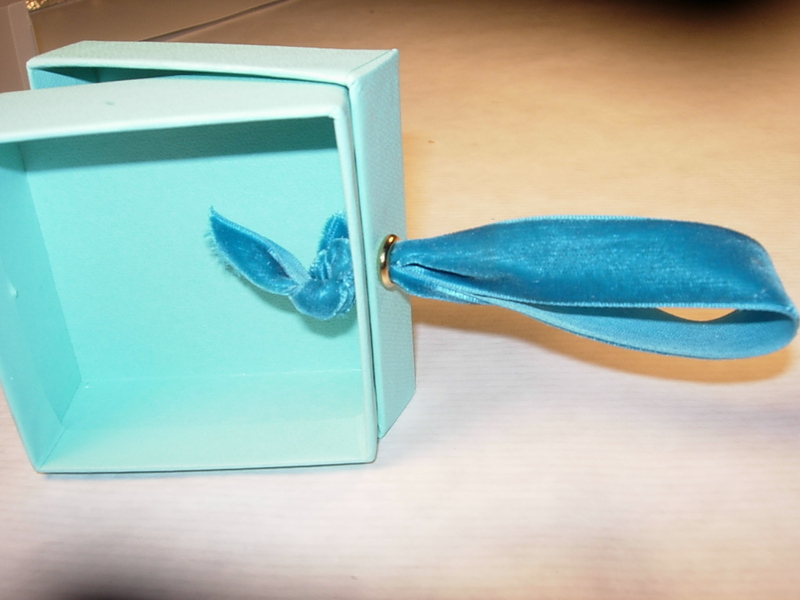 Pull ribbon so knot is securely against the inside of the box and the bead, ring, or button is against the outside of the box. 5.Turn the lid so the box and lid are lined up correctly. 6. Mark center on bottom part of lid and box with a pencil and push a straight pin through each to make a small hole. Cut a 5” piece of 20 gauge wire and tie or wrap it around a jump ring. 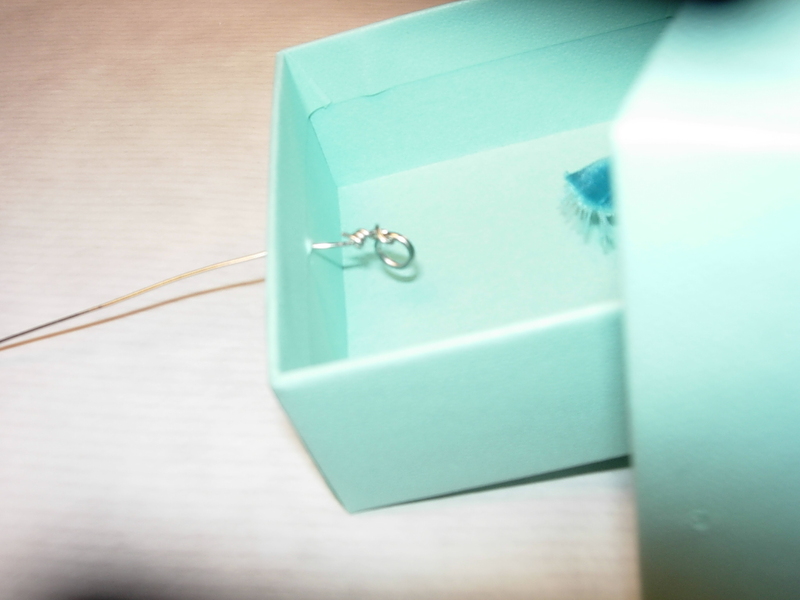 Pull wire through hole from the inside to the outside of the box until jump ring is against the inside of the box. 7. 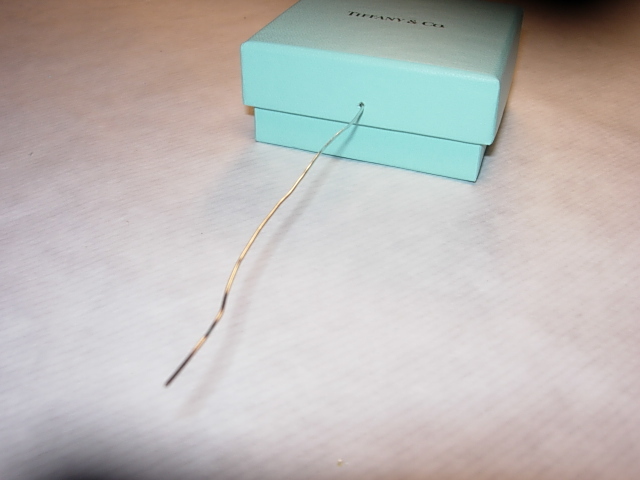 Thread wire through lid and then pull wire through and close the box. 8. 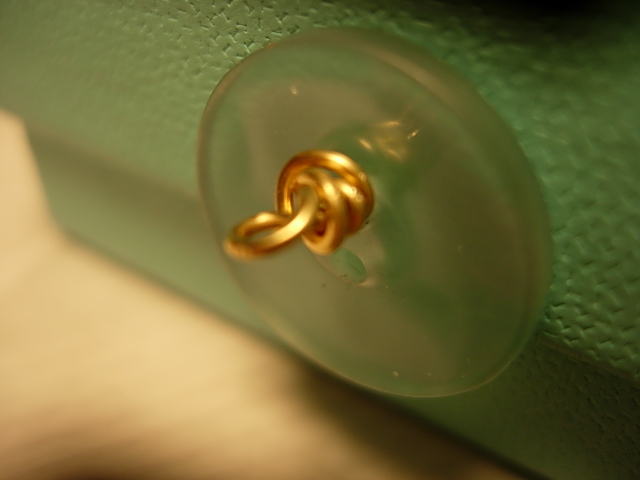 Thread a button through the wire so it is against the outside of the box. Create a wrapped loop right against the button. Clip excess wire off. 10. 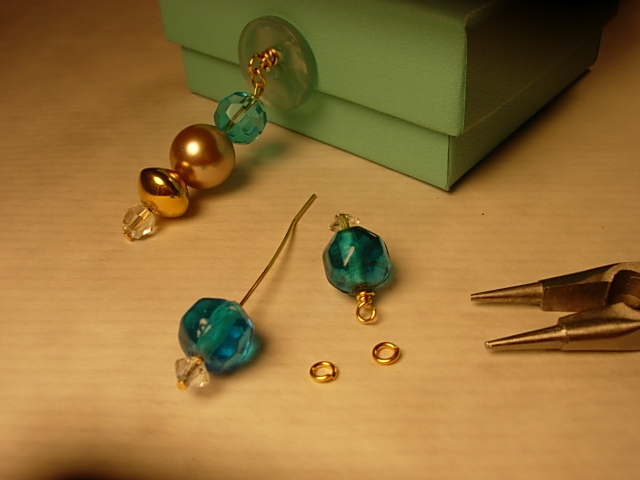 Attach dangles with small jump rings to the wrapped loop on the box. Hang on your tree. What a great idea! 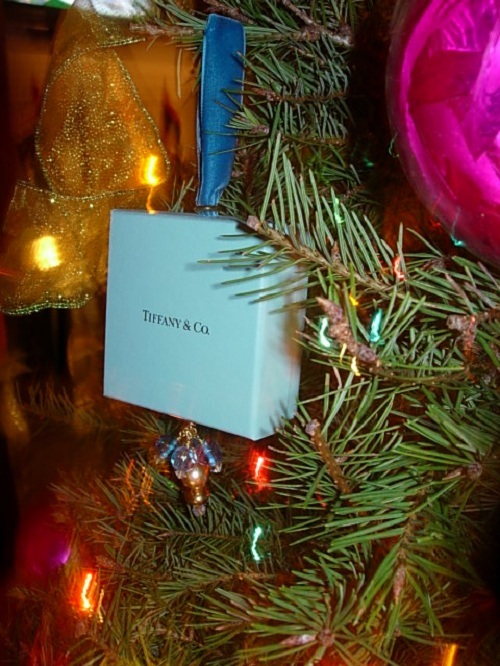 Who would not want a Tiffany & Co Box on (OR UNDER) the tree! Happy Holidays!